In the atrium of the Royal Palace in Dedinje, located between the palace and the Chapel of St. Andrew, the sculpture Raging bull, the work of the Montenegrin artist Branko Tomanović, is on display as a part of the permanent setting. This sculpture became a part of the Art Collection of the Royal Palaces in Dedinje in 1962 when it was brought from the Gift Depot of the General Secretary of the President of the Republic. During the second half of the 20th century, the Yugoslav art scene was stylistically heterogeneous. Among the sculptors a traditional line was represented by artists Risto Stijović, Frano Kršinić, Sreten Stojanović etc. These sculptors were linked with the similar poetic expression that we can call intimate lyricism. Sculptor Branko Tomanović, who studied art in Belgrade and lived and worked in Montenegro, also belonged to this group of artist. Tomanović’s free standing sculpture – the Raging Bull, presents us with an animal in the size smaller than natural. 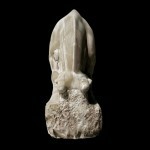 The body of sculpture and the pedestal, with the artist’s signature, are carved from the same stone block of red marble from the Bay of Kotor, Montenegro. 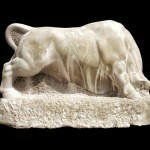 The figure of bull, with tense muscles, and his head bent and hidden between his front legs, is carved with the care of a classicist. The smooth treatment of the body is in contrast to the rustic pedestal, and the accent is placed on the structure in order to tell the story. Tomanović’s bull emerges from the stone monolith. The body and the pedestal are intentionally connected. 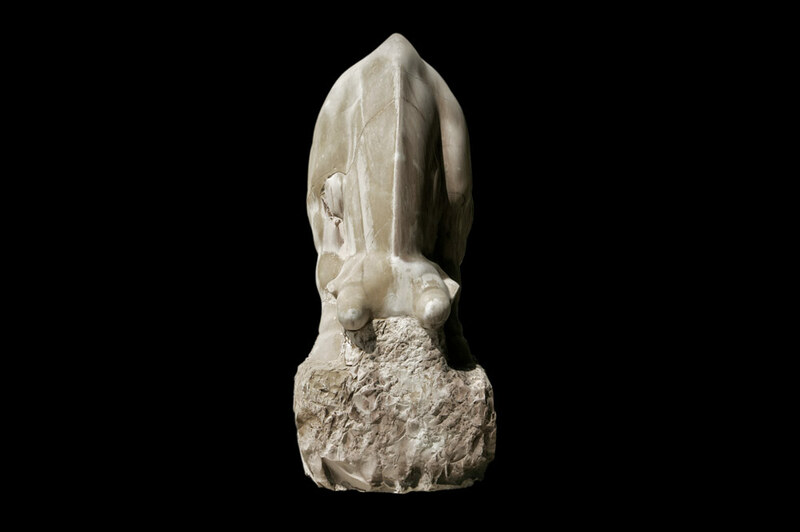 The artist uses natural characteristic of stone to transfer to the viewer the energy that this animal emits at the moment of charging, before the attack. 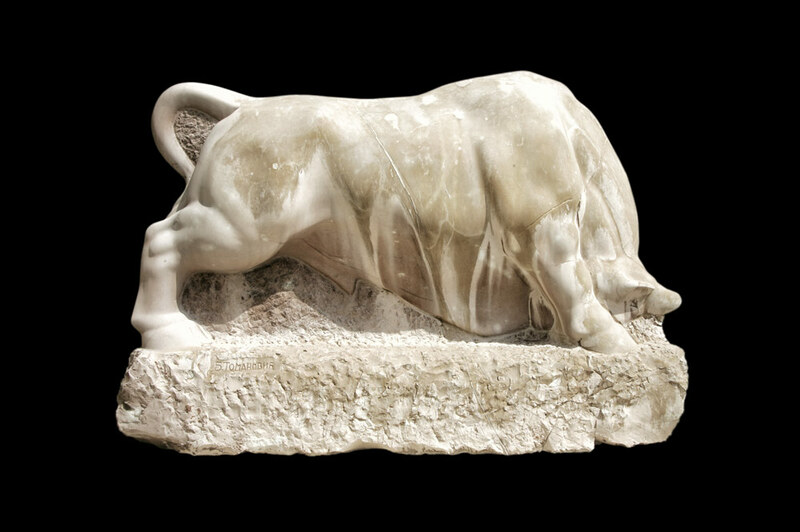 By opposing the smooth body of the bull and the rustic pedestal, and with the closed, round form of the body, the sculptor concentrates the energy inside of the stone monolith. The moment that is anticipated is the moment of the attack of the raging bull – the release of energy and the bulls release from the restrains of marble. Branko Tomanović was an artist from Montenegro who spent most of his life and career in Nikšić. He finished middle art school in Herceg Novi, and graduated from the Academy of Arts in Belgrade in the department of sculpture. Tomanović is primarily a sculptor, although sometimes he painted. He mostly made portraits in stone and wood. He had solo exhibitions in Nikšić, Kotor, Podgorica, Terni and Spoleto. Since 1958 he exhibited with other members of the Montenegro Art Association. He received many awards among which the most prominent are the award of the Serbian Art Association in Belgrade, golden medal from the city of Terni (Italy) and a Medal with a silver star for the contributions to the people.